SuvotolTM is indicated for the treatment of insomnia, characterized by di_culties with sleep onset and/or sleep maintenance. Recommended dose is 10 mg, no more than once per night taken before 30 minutes of going to bed, with at least 7 hours remaining before the planned time of awakening. If the 10 mg dose is well-tolerated but not effective, the dose can be increased, not to exceed 20 mg once daily. Lowest dose effective should be used for the patient. 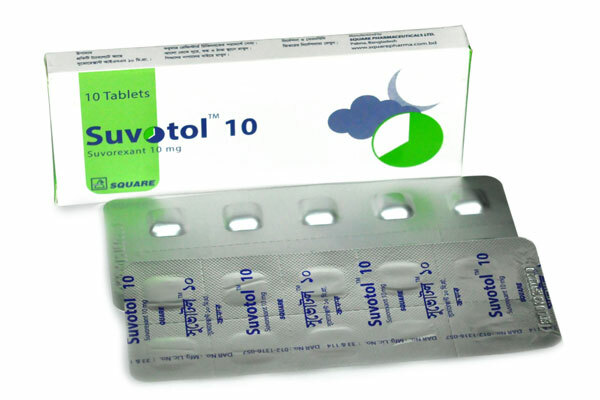 SuvotolTM 10 tablet: Each box contains 10 tablets in blister pack.